The picture of this scarf representsthe mantle of Roger II of Sicily, who was the first Norman king of Sicily. At the center of the picture there is a palm tree with seven branches that symbolizes the tree of life ; to the sides of the tree there are two lions that overpower two camels. The lions represent the king Roger II, instead the camels represent the Arabs, so the camels between the paws of the lions represent the Arabs overw helmed by the Normans. This picture represents “Furious Orlando”, the most important of Franch paladins, trusted knights of Charlemagne. The Franch paladins adventures become a part of Sicilian culture in the XIX century, when skilled artisans begin to decorate the Sicilian carts with colorful paintings that represent the Franch paladins adventuresthat become, therefore, a symbol of sicilian culture. In particular “Furious Orlando” is a very important symbol of Sicilian culture because represents a courageous hero who is devoted to his duty as a good knight. This picture represents the natural reserve of Vendicari, located in the eastern coast of Sicily, between Noto and Pachino. Vendicari is one of the most beautiful oases in the world for its rich flora and fauna, but also for its ancient archaeological and architectural remains which are inside it: greek quarries, byzantine catacombs, medieval fortifications necessary to report and repel the attacks of Saracens pirates. In the painting an imaginary mermaid enjoys the crystal clear sea of the reserve and beside her, there is a pink flamingo which lives in the Vendicari oasis in the autumn. In the left side of the picture there is the white wild lily which is the typical flower that grows on the sand of the Vendicari oasis. In the background of the picturethere is a tuna that dominates the central area of the reserve. It was built in the eighteenth century and became, because of its fascinating structure, one of the symbols of the oasis. This painting shows the fight between Franch paladins, who are the trusted knights of Charlemagne, and Saracens. 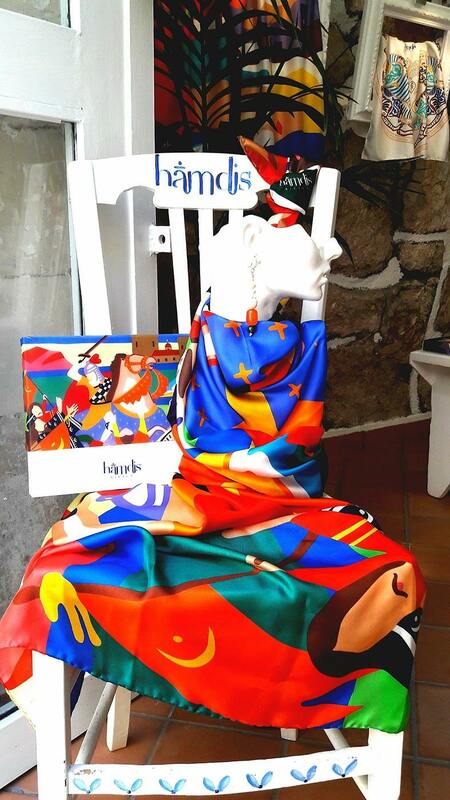 The Franch paladins adventures become a part of Sicilian culture in the XIX century, when skilled artisans begin to decorate the Sicilian carts with colorful paintings that represent the Franch paladins adventuresthat become, therefore, a symbol of sicilian culture. Hamdis is a Sicilian luxury brand of pure silk scarves that are dedicated to different pearls of Sicily. 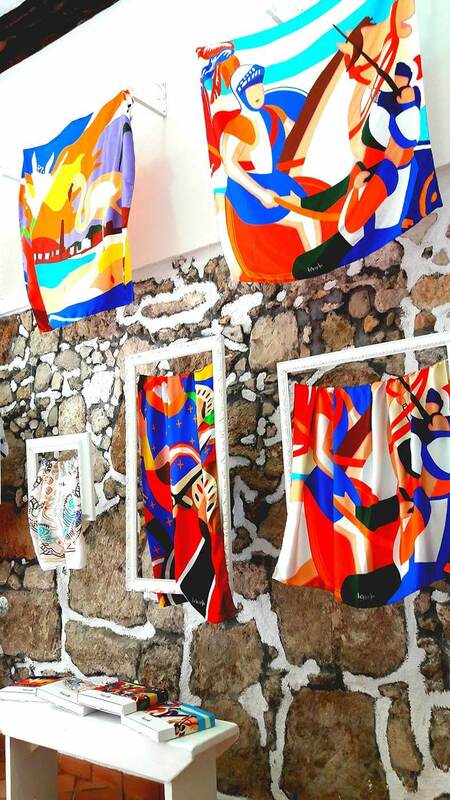 Hamdis, in fact, is the brainchild of Giulia Zuppardo who wants topromote and enhance herland by creating precious silk scarves, all hand-hemmed, that depict thebeauties of Sicily. 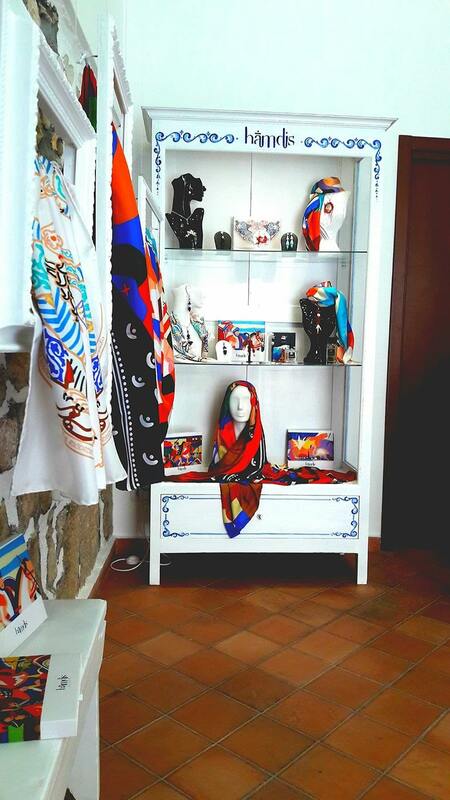 The pictures reproduced on the scarves are handmade designed by Sicilian artists and they are characterized by intense and strong colors. These pictures represent the natural resources of Sicily, the strength of its contrasts, its mysteries and all thecultural heritage of Sicily, that is a gift left by the many peoples (Greeks, Romans, Arabs, Normans, Spanish) who dominated this fertile island. Also the choice of Hamdisas a brand is a tribute to Sicily, and especially to the Arab-Sicilian poet “Ibn Hamdis” (XI century) who lived, during his youth, in Syracuse and in Noto, two cities that he was forced to leave because of the Norman conquest of Sicily. Ibn Hamdis, during his wanderings from place to place, always kept alive the memory of his land,and so he dedicated to Sicily very beautiful poetries. 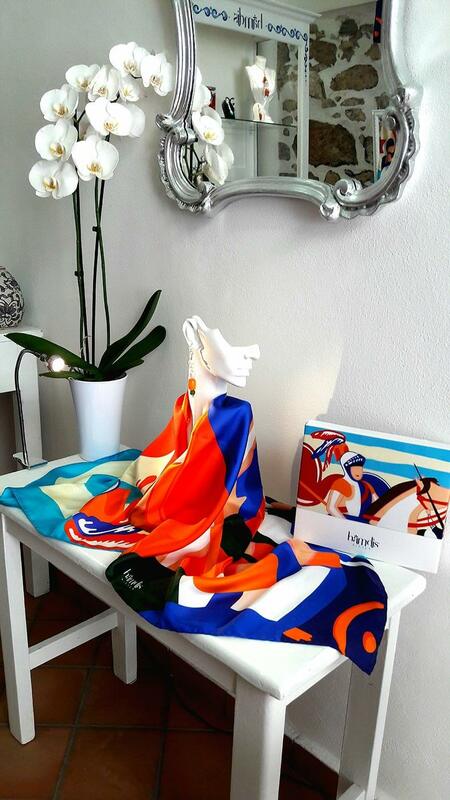 The hamdis scarves are, therefore, exclusive accessories through which you can discover and wear Sicily, and finally be caressed by its poetry. This site and the materials contained therein (such as text, images, graphic, video, audio, software and any other form of intellectual property) may constitute works and can therefore be protected by the law on copyright. The violation of the rights contained therein may therefore require application of the criminal and administrative penalties for which the art. 171, 171-bis, 171-ter, 174-bis and 174-ter of the law 22 April 1941 n. 633 ,in addition to civil penalties under the Italian Civil Code. The works of which the source is indicated are the exclusive property of their respective holders and their dependents. Unless otherwise indicated, all rights belong exclusively to Privacy. The material on this site therefore may not be reproduced, by any analogue or digital means, directly or indirectly, temporarily or permanently, in whole or in part, without the written consent or the respective owners. All trademarks, registered or not, and other distinctive signs on the site belong to their respective owners and are not licensed or in any way subject to facts available, unless otherwise indicated. It is forbidden in particular to use the mark, the images and graphics of the site, without the prior written consent. A cookie is a small text file that is installed on your computer, on your smartphone or other device when you visit a website. The cookie helps the websites to recognize the devices in their subsequent visits. There are other similar technologies such as pixel tags, web bugs, web storage, and other files and similar technologies that have the same function of cookies. This document uses the term cookies to describe all the technologies that collect information in this way.